18th century paper doll gown to print and play with! Printable Black & White PDF Printable Color PDF More Paper Dolls & ClothesWhen I first decided I was going to create paper dolls in period underwear, I knew it would slow down my historical paper doll dress drawing. After all, once you put a paper doll in period underwear you have to make sure that the clothing you create for the paper doll fits over whatever the period undergarments are. It’s much easier to work from the bottom layers to the top layers in paper dolls. You draw the doll and then the underwear and then whatever goes over the underwear and then you do coats or whatever. 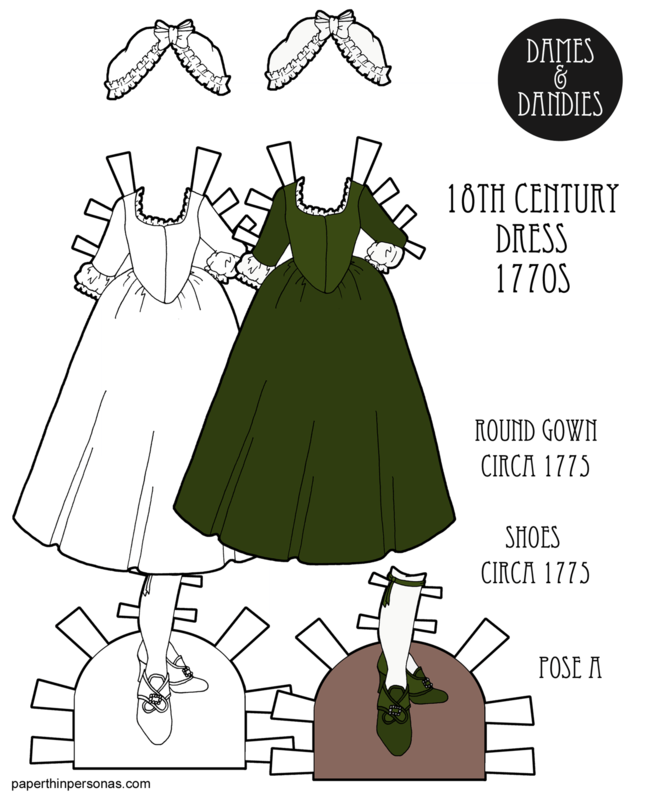 I also knew if I was going to go to all the trouble of drawing underwear and affixing that underwear in Photoshop and printing the doll again, I was darn well going to make more than 18th century paper doll gown to go over it. After all, if I only drew one dress than the return on paper doll underwear time investment would be fairly low. So, when I drew Alice in her 18th century underthings I drew two dresses. The first was the classic very formal gown I shared several weeks ago. Today’s 18th century paper doll gown is a lot less complex and generally seen as less formal. Today’s 18th century paper doll gown is a round gown. Round gowns were gowns that fastened in the front and had no stomacher. The bonnet with the dress is based on this portrait and lots of examples from my costume history collection. The matching shoes were also inspired by the Met dress, because that gown also has shoes that were made to match. One more quick thing, if you hope over and grab 18th Century Alice, because an 18th century doll down might need an 18th century looking paper doll, the hoops will not fit under this dress. Round gowns did not have the huge wide skirts that those hoops were designed to support. So, just bare that in mind. Also the bonnet is designed to fit over Alice’s hair, I don’t know how well if would fit over the hair of any of the other A Pose paper dolls. Need a doll to wear today’s paper doll clothing? All the A Pose Dolls & Clothing, but I would recommend 18th Century Alice with her period underwear. We went to Colonial Williamsburg a couple of years ago and I made round gowns for my daughter and I, they were a lot of fun to wear, complete with period undergarments.